It’s no secret that video blogging, or vlogging, is essential to successful social media marketing campaigns. Nothing connects with potential customers like a video; nothing breeds a feeling of familiarity better than this powerful medium. Through it prospective clients meet us, either literally or personified through brand portrayal. They get a sense of our personalities, and so our brands’ human sides are allowed to emerge. While recognizing the importance of video as a social marketing tool, we must also acknowledge that brevity is the goal for which to strive. We want to capture our target audiences’ attention and stoke their enthusiasm, not cause their eyes to glaze over because we are too long-winded. 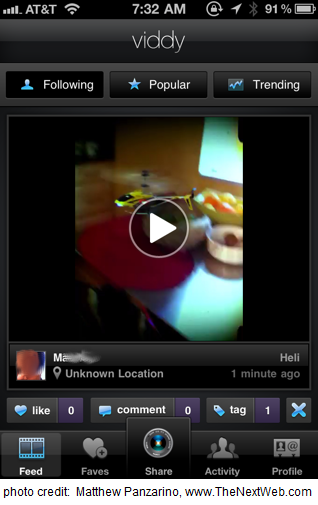 Enter Viddy, a fairly new iPhone app that is geared to just such a style of creation and delivery. I like to refer to it as the Twitter of vlogging since, like Twitter, we are limited in the length of our posts. As we need to think and plan the most effective way to deliver our messages within the 140 character limit of Twitter, we must also hone our video communications to hit their points within a maximum of 15 seconds for Viddy. In actuality, Viddy’s qualities are more like a cross between Twitter for its brevity and Instagram for its easy editing and sharing capabilities. With the iPhone app it is very simple to shoot footage, edit by using filters, soundtracks and other special effects, and then easily post our finished products to Twitter, Facebook, blogs, or to send them via emails and text messages. I do want to mention that there is a sister app named ViddyMe for Android. Unfortunately, that version does not provide edit functions, and the video quality is poor to fair at best. Unless it is markedly improved, I see little use for the Android app beyond casual personal sharing. According to Mashable, Viddy had 26 million users as of May, 2012. Pretty good considering the app is just about a year old! With all the features it offers, and the ease with which it allows us to create and share our all-important videos, I foresee a long, robust life for Viddy! Are you using Viddy? What are your thoughts about the application? Please share your perspective in the comments section! This entry was posted in email, Facebook, Social Media Management/Marketing, Twitter, Viddy and tagged email, Facebook, Jeanine, Social Media Management/Marketing, Twitter, Vecchiarelli, Viddy by Jeanine Vecchiarelli. Bookmark the permalink.